Peace to you and yours on this Blog Blast Day! I LOVE IT!!! I agree with Travis, Pups For Peace ROCKS!!! That is a terrific globe! 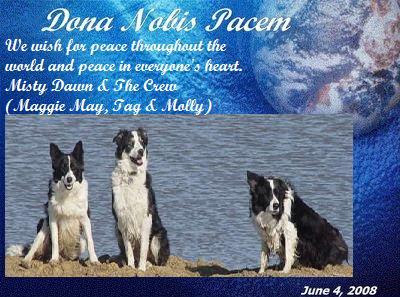 Peace to you and Maggie, Tag and Molly! Wonderful peace glob, Mist! Peace to you, me and all of us. Have a peaceful day, Misty & the gang! Peace to you and the pups!! Thank you so much for celebrating my birthday with me - love ya all from the tip of my tail! I ♥ your Peace Globe - and you, girlfriend! Love and Peace to you and yours, sweets! Thanks for being such a great friend! I shared different Peace Globes and Blog Blasts for Peace on each of my sites last Wednesday too, and am still visiting others who did so. Wasn’t this a wonderful idea! Here’s wishing you a peace-filled day … every day!